A famous television home decorator personality has a segment called House Proud. For me, house proud is celebrating the little touches of style around your house. Like, a splash of color in an entryway or a special item displayed on a shelf. These unique elements of style reflect you and your family. I have a new photo display that I am thrilled about, Vizardz. What is Vizardz? Vizardz takes your favorite picture and turns it into a 2.5D picture. Say good-bye to standard flat photos. 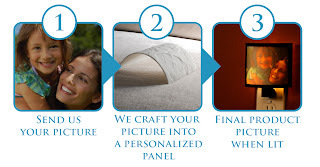 This company creates multidimensional images. How does this work? 2.5D pictures combine a three-dimensional topography with your two-dimensional digital photographs and images. This combination adds depth, texture, and contrast to breathe life into your ordinary photos. With light behind a Vizardz 2.5D picture, the result is a 3D image. Take a look at the example. I took one of my favorite family photos (we all are at my kids' first professional football game) and had a Vizardz night light made. Not only do I love it, but my kids fight over who would get the night light in his room. I settled the argument by adding the nightlight to our basement. The nightlight has depth and perception. You can see us in front of the field and large amounts of details are visible. From the colors of our shirts to the fans in the stands, it is a wonderful way to capture a memorable moment. Plus, it shows my friends and guests a little insight to my personal style in my home decor. If you are interested in getting a Vizardz nightlight or photo box in your house, I would suggest using a landscape oriented photograph. The orientation allows for more detail to show. Vizardz products can be purchased on-line at http://vizardz.com/. Nightlights start at $39.95 and light boxes start at $68.95. Would you like a Vizardz night light in your home? Please use the Rafflecopter form to enter. I received one or more of the products mentioned above for free using Mom Blog Society Regardless, I only recommend products or services I use personally and believe will be good for my readers. For my personal disclosure policy, please visit www.more4momsbuck.com/disclosure. My favorite birthday memory is when my dad took me flying for my 4th birthday. My favorite birthday memory is when my husband surprised me with a trip to a spa with my girlfriend. He told me he and I were going to Vegas but on the way to the airport he pulled over in a parking lot and my door flew open and my girlfriend was there wisking me off to a spa in Mexico. My favorite is when I turned 8 and invited the Whole class and they all showed up with friends~over 50 kids!! My suprise trip to Disneyland. a trip to the lake....with everyone..
My favorite birthday memory is when I turned 25 and my mom and sisters took me to New York! I was born on Dec. 21 so it was great to be there around Christmas to celebrate and see the sights. My son's first birthday...he was adorable! My favorite birthday memory is when I was little and we had a really awesome roller skating party! My favorite birthday memory is from when we had a pool party! Everyone had a blast! My favorite memory is a surprise birthday party that my parents had for me on my 13th birthday. My favorite birthday memory is when Cinderella came to my birthday. My fifth grade birthday when I got to have a massive sleepover birthday party with most of my fifth grade female classmates there. I think it was when I was 7 years old and my parents got me a lovely watch for a gift. my last birthday because I was blessed with an amazing little boy to celebrate it with! My 8th birthday was Alice in Wonderland and it was awesome...we had a slide covered in black cloth that was the rabbit hole, a refrigerator box was covered with paper & rosebushes drawn on...we had to "paint the roses red" blindfolded, we made shrinky dinks...I will never forget it! Going to Disneyworld for my birthday! Going to a resort at the beach with my husband was great! Celebrating my birthday with my husband for the first time. My favorite birthday was Carters 1st birthday last year. The whole family came and we had such a wonderful time! Precious! I remember my mom telling me to invite 15 kids and about 30 showing up. She was very frazzled. My 9th B-day at Celebration station which was a carzy whirlwind of fun! When I was 7 my sister was born on my birthday and since I had always wanted a sister I really thought that my parents had had her for my birthday present. Celebrating my baby's first birthday is my favorite birthday memory. The whole thing...especially the cake! My favorite Birthday Memory would have to be when I was little and I couldnt wait to see what my cake would look like. It would always be a home made cake that was excellent and it looked better than the ones from the store.